A PhD student in the department of geodesy and geomatics has designed a robot that can navigate corridors and perform tasks on command. While designing robots is a feat on its own, most of Hui Tang's research has been focused on developing the code and algorithms that the indoor robot (which she calls, iBot) relies on to make its way through buildings. Sensors that are installed on a building's walls provide information to the robot about its position, direction and surroundings. This information has to be even more precise than the GPS technology that enables outdoor robots - like drones - to travel. While the robot's path is currently pre-programmed, the next step in Tang's research is to have the robot plan its own route and avoid obstacles. 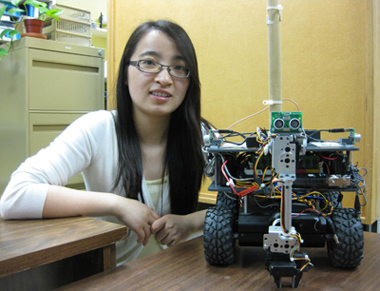 Tang chose the University of New Brunswick for its reputation as a leader in engineering, and her interest in working with Dr. Don Kim in the field of positioning and autonomous navigation. She was also impressed by the beauty of the campus and city of Fredericton. For more information on Tang's research, see Independent robots may soon help in hospitals (CBC).